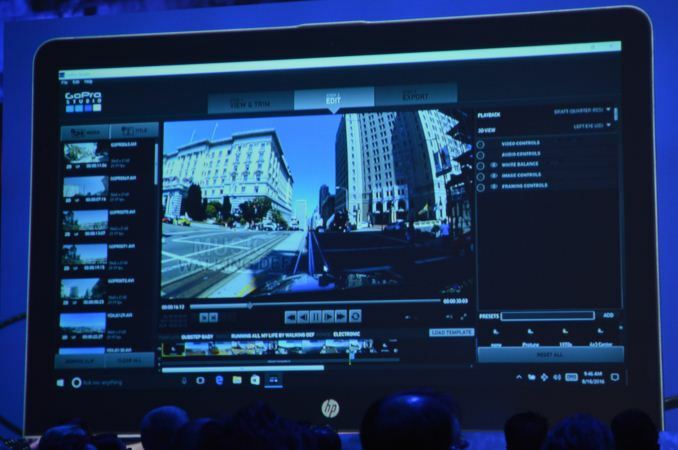 During the Intel Keynote presentation today at IDF Brian Krzanich, CEO of Intel, demonstrated several upcoming Kaby Lake 2-in-1 prototypes from HP and Dell. While no concrete details about the 7th Generation of Intel Core products lines were given, we were offered a couple of bits of information to tide the hype until a full launch. On the stage, support for HEVC Main10 Profile was announced with 7th Gen, although it was unclear if this was decode only or encode as well. This is still a step up from Skylake support, where Main10 required hybrid hardware/software decoding acceleration. Moving it into hardware for Kaby Lake will help with performance and power consumption, particularly of 4K content where HEVC vs. H.264 differences are bigger than Full-HD. The demo on stage showed GoPro software taking 4K data from six cameras and being able to switch between the content of each camera without stuttering or delay, on a 2-in-1 mobile device. 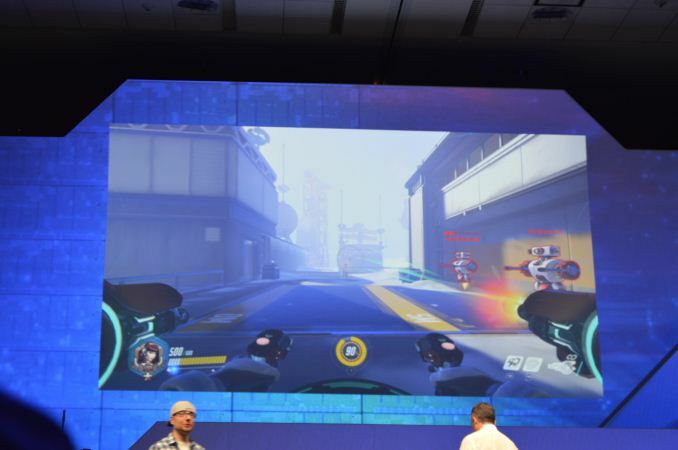 For gaming, we were treated to a demonstration of Overwatch being run off of the 7th Gen IGP. That being said, it was not mentioned what the resolution or quality the game was running at, and V-Sync was not enabled. Intel clarified that the demos on the stage were from their highest performance CPUs, but the fact that only 2-in-1s were on display demonstrates that Kaby Lake will be focused on mobile first. The HP and Dell prototypes also add to the ASUS prototypes we saw at Computex earlier in the year. Intel stated that 7th Gen CPUs are already in the hands of partners, ready for production devices, and we should expect to see them in the hands of consumers this autumn. Again, given the focus, it seems we will encounter Kaby Lake in mobile form factors (4W and 15W) before anything on desktop. 1. Unknown as yet, IPC is likely to be in the same ballpark though (finally!) even if KL edges it by a few percent. Clock speeds at various TDPs and real-life battery usage are what matter in the end and these figures are a way off being tested. Maybe even Cannonlake will be the competition, not KL. vega level would take too much power. something 460 sized would be about as big as a 125 watt APU could take.